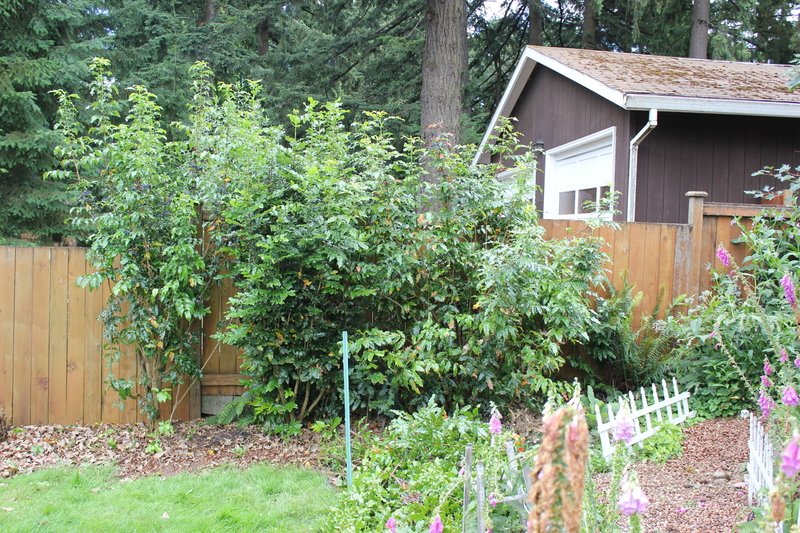 The reality is more like this: Today, in the garden, I decided to tackle the overgrown Oregon Grape. 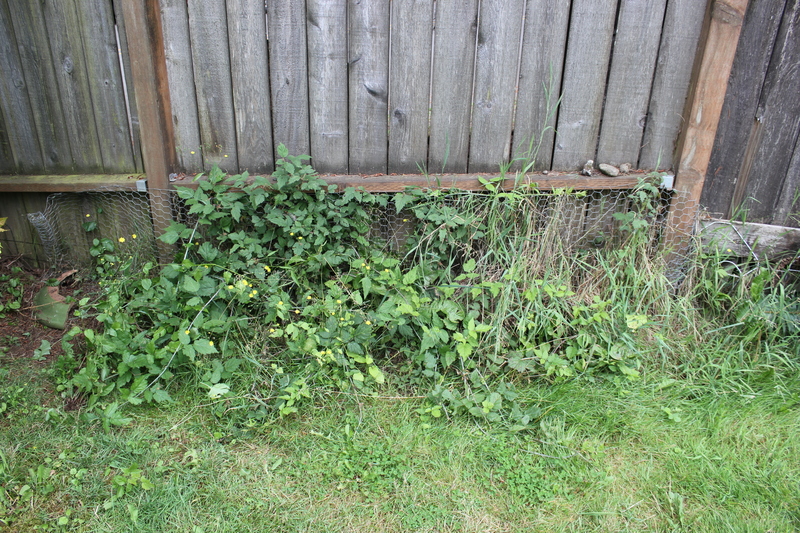 I also wanted to clear the weeds away from the fence. It is hard to see just how unruly the Oregon Grape is. I planted this variety in error: I thought I was getting the native Oregon Grape, which grows close to the ground and scares werewolves away (my father told me that when I was ten, and so it must be true). What I got was this commercial variety that grows over six feet in height, falls over, and is generally unruly. We’ve never had any werewolf problems, so it probably does repel were wolves as well. 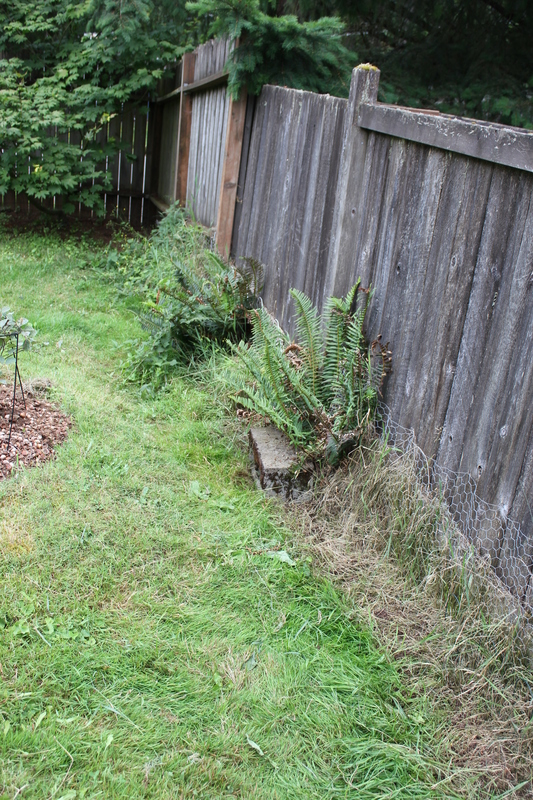 The weeds and blackberries, on the other hand, serve no purpose except to irritate me and thwart the lawn mower. 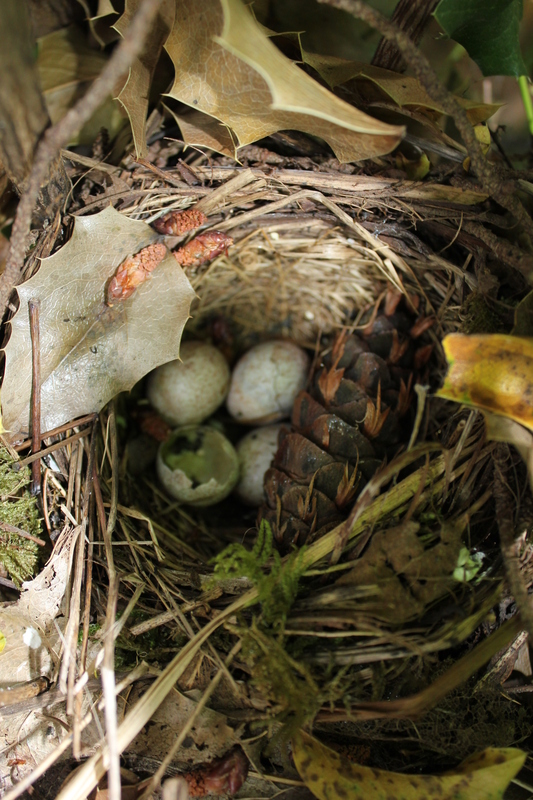 We did have a Spotted Towhee attempt to start a family in the thickest and most upright Oregon Grape, but the sharp, spiny leaves were not enough to hinder the nosy bird dogs, and the Towhees left the nest shortly after laying four pretty spotted eggs in it. No matter how I twist and turn with the camera, I can’t get the lens to focus on the eggs. 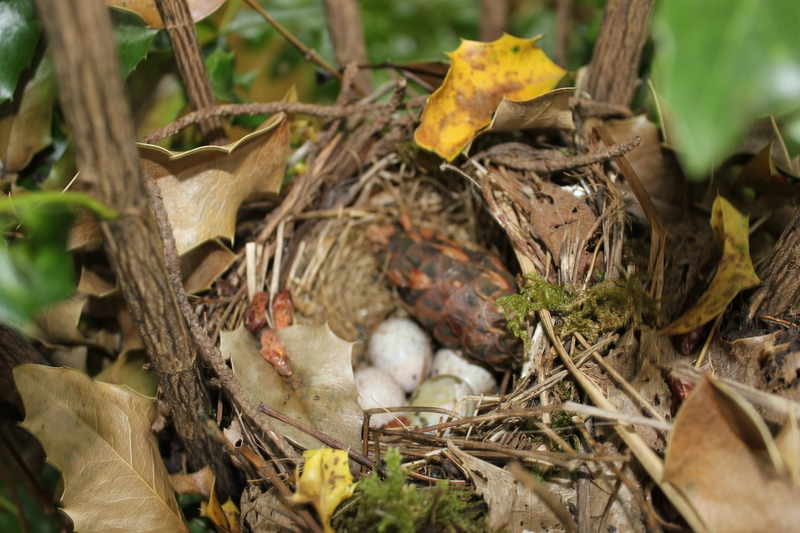 It wants to focus on the nearest detritus: the rim of the nest and old leaves. One egg has exploded, or was broken into by a predator. The others sit there, the same as when we found them a nearly two months ago. The towhees must have found a safe place to hatch eggs, as we watched them bring their brood of fledglings around the front yard. 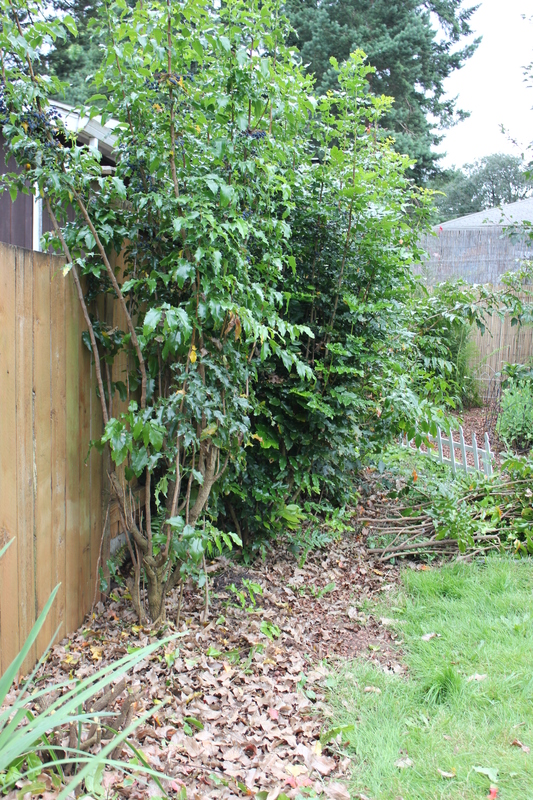 I did not take a before photo because I didn’t set out to eliminate this last Oregon Grape. It will probably regrow. 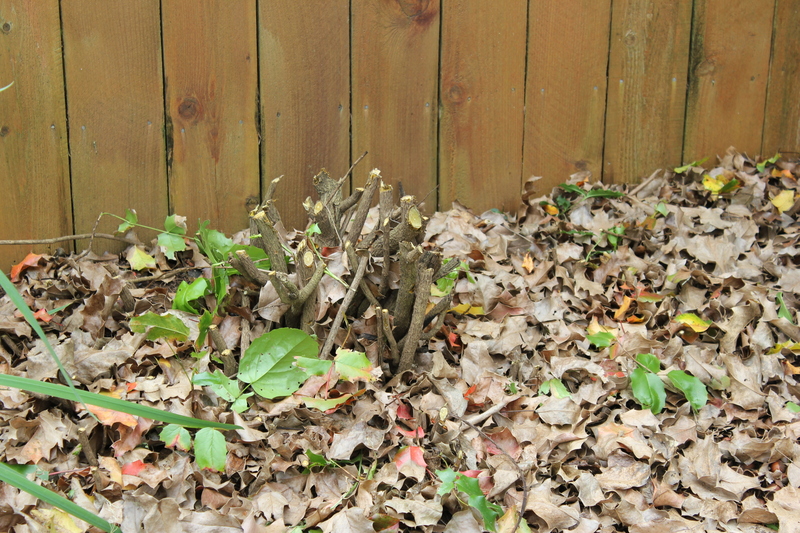 It was very spindly and the branches fell every direction, creating an unsightly mess. The remaining three have stronger bases and tend to grow up, not out. Then I worked my way down the fence. All was good. I yanked on a good bunch of weeds and they came out, followed by a torrent of yellow jackets. My instinct was to get up and run, but I lay back very slowly and allowed the angry wasps to fly over me. Then I slowly rolled over and stood up calmly before walking deliberately back to the house. Unfortunately, the head of the host had made it to the corner of the house and Murphy got stung because he flips out around wasps. I ushered the dogs into the house and closed the door. Still, I managed to get two of the wasps in the house: one that got lost in the bathroom, and one that must have fixed on my garden gloves when I pulled the weeds out. I didn’t know it was there until I pulled my gloves off and it bit me (yes, bit, not stung). Poor Murphy! He was so freaked. He wanted to eat it but he had also been stung, so his tail was tucked and he wouldn’t venture any closer to my garden gloves on the kitchen floor. The wasp didn’t associate me with the gloves and was circling them and stinging them, repeatedly. Between my husband and myself, we managed to get both wasps trapped between the window and the screen, where we left them to die. I waited until the wasps had calmed down before I went back out to pick up my garden tools and I marked the site of their underground lair so I can spray them at dusk (on a windless night: tonight, the wind has come up). Yes, I will spray them. 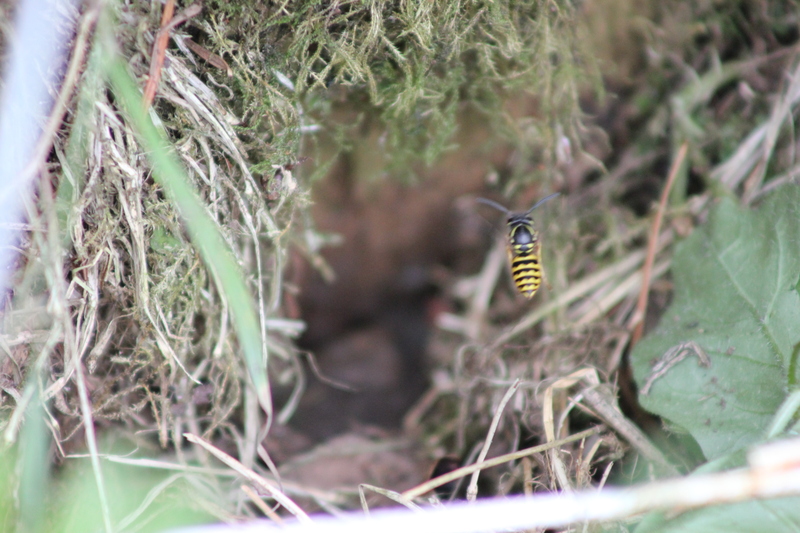 I dislike chemicals and insect sprays, but yellow jackets nesting in the ground in the yard get sprayed. Murphy is allergic to them. I need to weed and tend to my flowers. They get aggressive and mean in August and September, and they argue with picnickers for bites of protein or sweets. I can live with them most of the time, but not when there is an entire nest of them. That photo was an accident. I was trying to force my digital camera to focus on the hive hole, which is at the base of the fence post. I did not know I caught this drone hovering on his way in for a landing. I never tire of the honey bees. And they never tire of the Russian sage. I wish I could capture the dozens hovering around the sage. Or the oregano, the lavender, the daisies – whatever prolific flower is in season. I wonder where they go when they leave my yard and what the honey they make might taste like? This one is playing chameleon. I love his shadow on the petals of the sunflower. The bees buzzed me several times while I was trying to get close enough to snap a good photo: stern little warnings that I was invading their space. But if I pressed the issue, it was the bees who moved away. They really aren’t up for a confrontation that might cost them their lives. They only get to sting once, then the stinger is lost and their life is forfeit. Unlike wasps, bees aren’t looking for a fight. The black bumblebees love our garden, too. When the rhododendrons are in bloom, we have two or three species of bumblebee hovering around, but as summer winds down and the pickings get slim, the social little black ones are all that remain. They love fireweed and this relative of borage. Like the honeybees, they will buzz at me in warning. Or maybe it isn’t a warning as much as they are just curious or I am disturbing them? I took several photos of this one and was amazed to get such a great shot of its wings in motion as it flitted from flower to flower. While I was bee hunting, I accidentally came across this guy resting on the veggie garden fence. I think it could be a spider wasp. Family: Pompilidae. But it could be Family: Ichneumonidae (check out the ovipositor on the end of the abdomen). Makes me wish I had captured it and could really look at it. But I turned my head and it flew off to points unknown.